And joining the show to talk about it are Jason and Natasha Moulton. 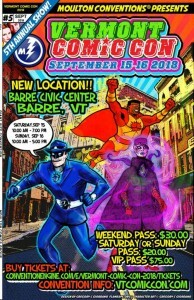 The con runs September 15 & 16 at the Barre Civic Center. The venue has wifi and tons of parking. Ticket prices are quite reasonable. There are also VIP Passes, discounts for Student, Senior, Military and First Responders. There is a Family pack discount as well. Jay and Natasha got the chance to speak about a ton of stuff. We talked about how the Guests this year (it is year 5) were chosen and how the Artists Alley, Vendor Areas and Panels have a distinct Vermont flavor, so if you have been to other shows, chances are real good that you will get to see and experience a ton of new stuff as well. One of the interesting things Natasha talked about was the Gaming Pavilion and VCC’s affiliation with Steve Jackson Games (Munchkin). It should prove to be a jam packed show with something for literally everyone. Come down and visit the Sci Fi Saturday Night booth. We look forward to seeing you all there.